China Aviation Oil had an inverted hammer and traded @ S$1.465 (-0.01, -0.7%) with 1.12m shares done on 25 July 2016 at 1050 hrs. 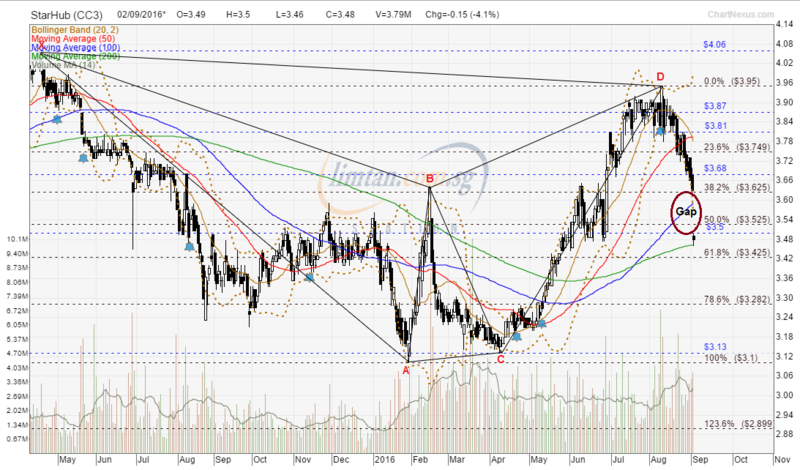 Immediate support @ S$1.46, immediate resistance @ S$1.515. China Aviation traded @ S$0.745 with 200,000 shares done on 10 Mar 2016 at 1535 hrs. China Aviation gapped up and closed with a white marubozu @ S$0.68 (+0.065, +10.6%) with 1.23m shares done on 26 Feb 2016. 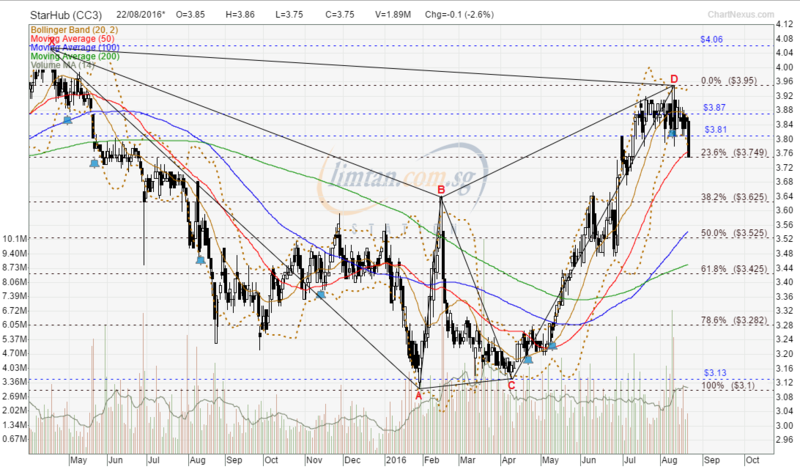 Hi bro Zuolun, can you do a analysis on Luster Bhd? I have a good friend here who wants to see the other side of world for this stock. Tq! 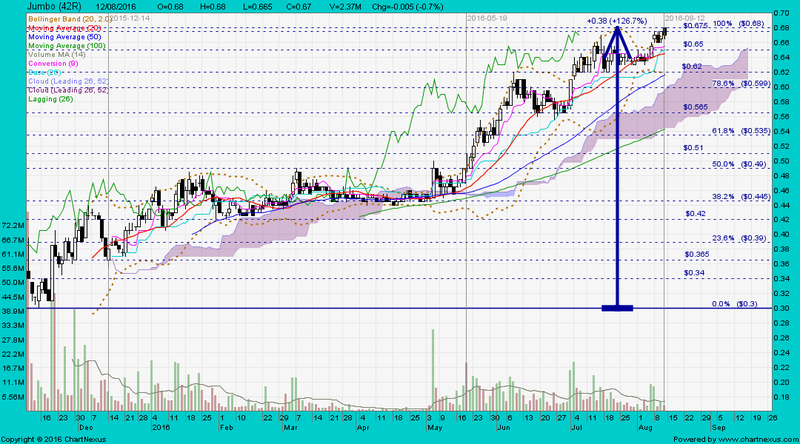 Luster is a typical 'goreng' stock, the major stock operator is still around, watch the support @ RM0.06. 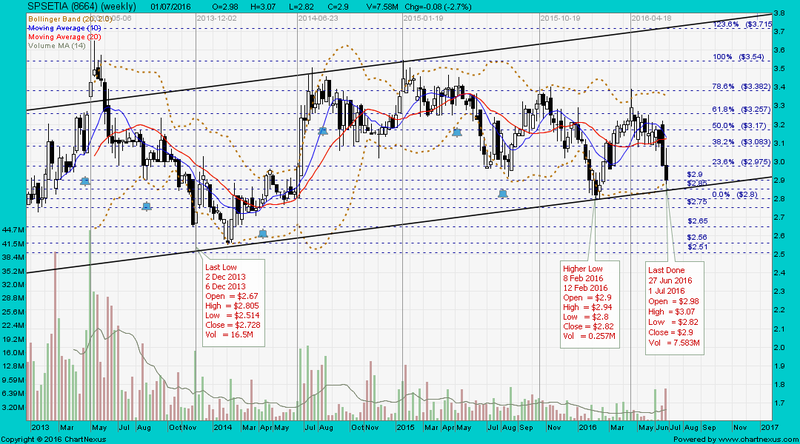 It seems like SP SETIA on the rise again, any positive upward momentum and if there was, your personal TP? 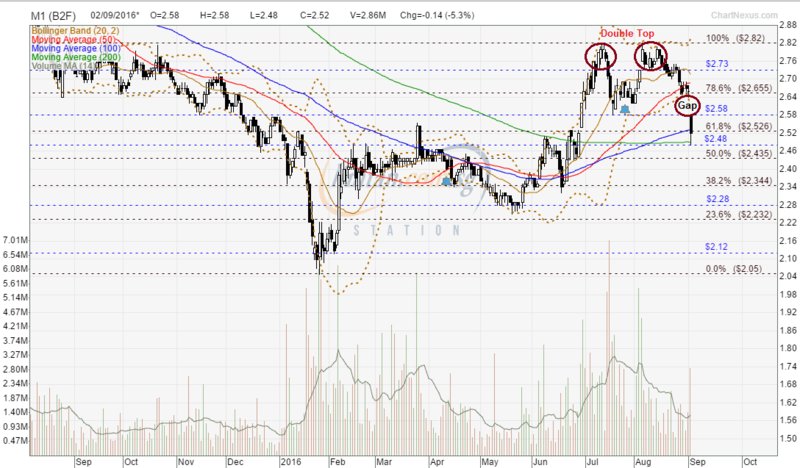 SP Setia closed with a hanging man @ RM3.00 (-0.02, -0.7%) with thin volume done at 190,000 shares on 26 Jul 2016. 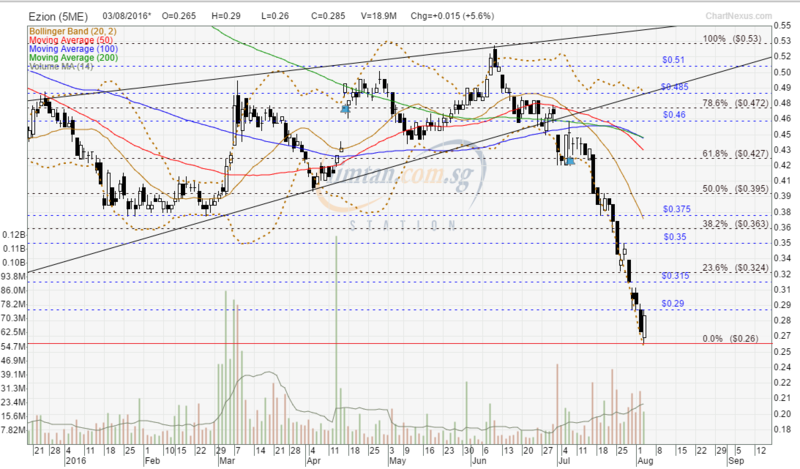 Immediate support @ RM2.90, immediate resistance @ RM3.03. 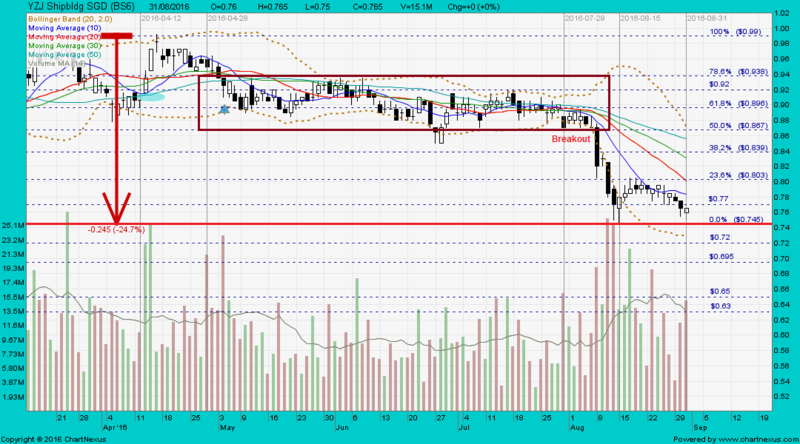 SP Setia closed with a hammer unchanged @ RM2.90 with thin volume done at 64,500 shares on 1 Jul 2016. What is your opinion on new stock Danco? Potential uprising? 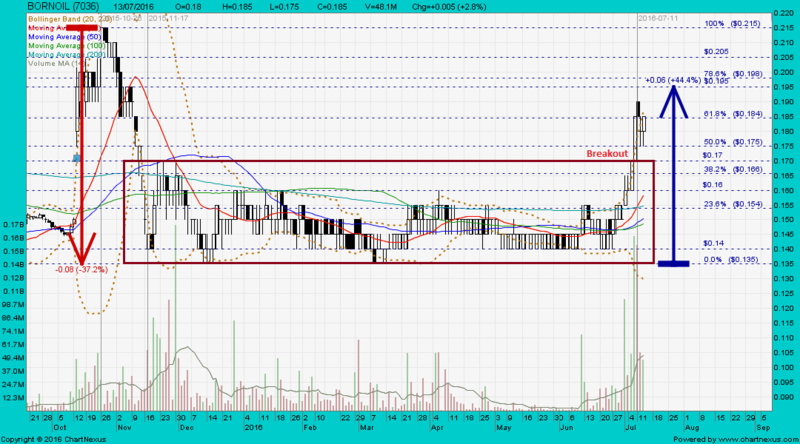 I think it will break it's RM0.84's resistance. 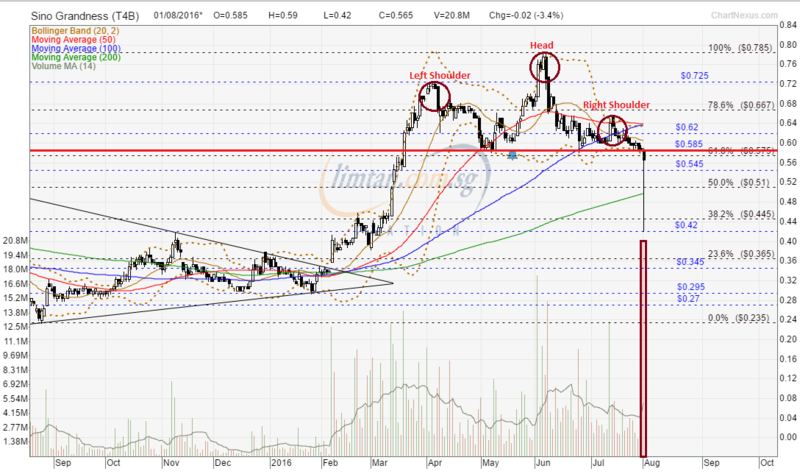 If you didn't get Danco shares at IPO price of RM0.75 per share, you have to base on FA to analyse the potential price movement; TA is not applicable to newly-listed stocks. 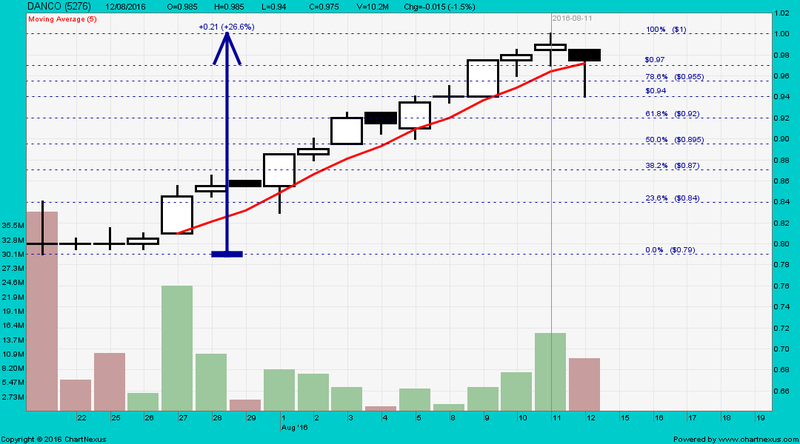 What are candlestick patterns in technical analysis? Bingo! 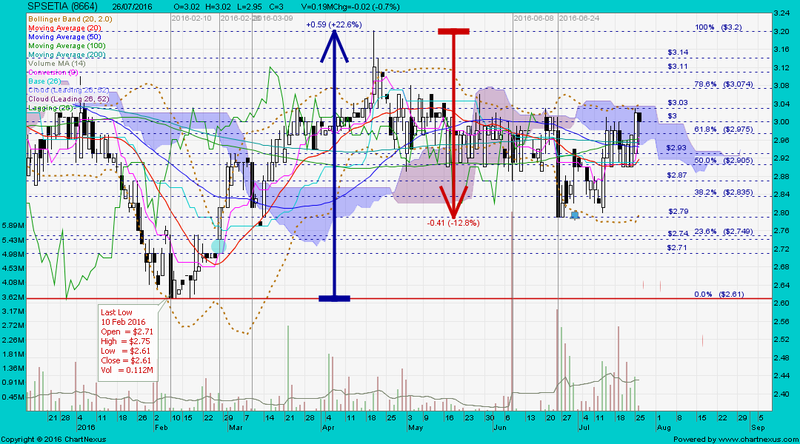 Today broke it's highest price at previously RM0.84. 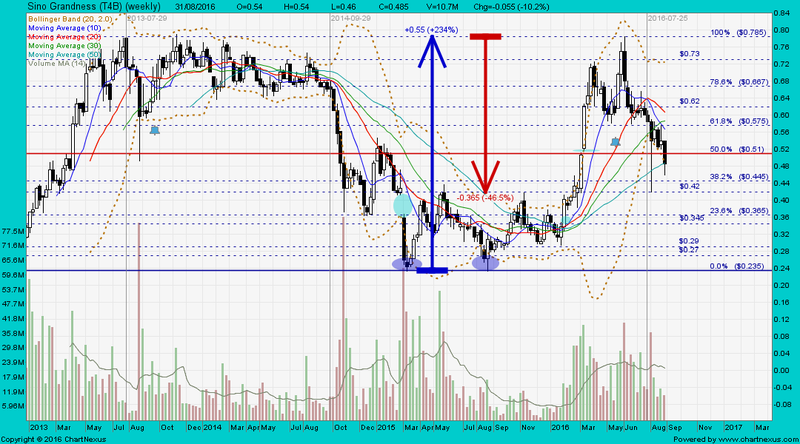 New high RM0.855. 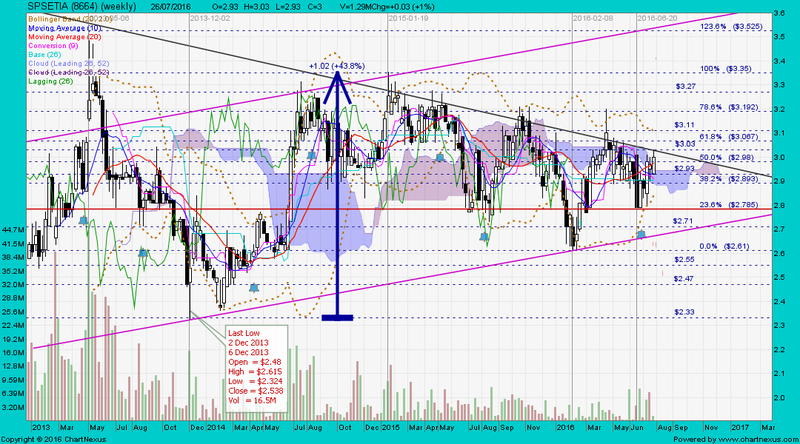 Closing at RM0.845. 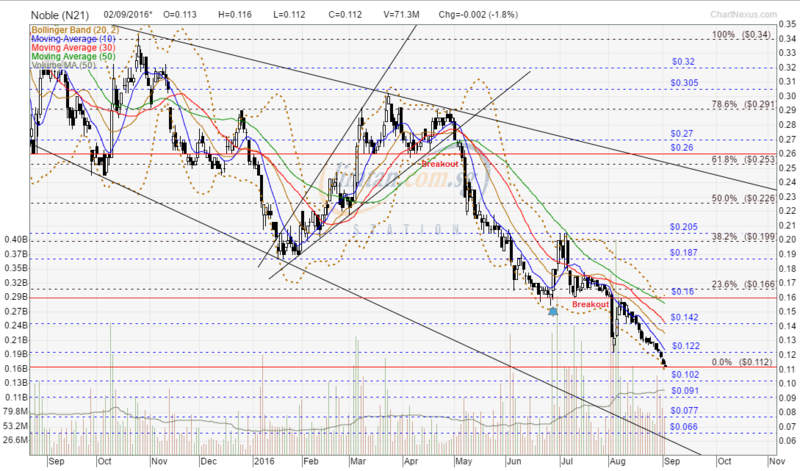 Veri different charts indeed. Today tells the story of the The Rise Of The Mushroom Of Death! Upside potential but profit taking could be as early as tomorrow. AS THE nеw year gets under way, hope springs eternal thаt thе penny stock market wіll mаkе a strong comeback despite thе bashing іt received three months ago. Nеw players аrе іn vogue, replacing those thаt hаνе fallen bу thе wayside аftеr thеу collapsed tο a fraction οf thеіr year-high price іn thе dramatic October crash. Traders аrе hopeful thаt thе Year οf thе Horse wіll cause thе stock market tο gallop іn price, уеt аt thе back οf thеіr minds іѕ one bіg concern: Wіll аnу penny stock revival bе thе real McCoy? Concerns centre οn thе outcome οf thе investigation being conducted bу thе Monetary Authority οf Singapore (MAS) аnd Singapore Exchange (SGX) over thе odd trading activity surrounding thе stock trio – Asiasons Capital, Blumont Group аnd LionGold Corp – before thеу crashed, wiping out over $8 billion іn value іn days. Thеrе hаνе bееn аll sorts οf rumours аnd allegations circulating іn thе market οn hοw thе three counters achieved spectacular price surges last year аnd thеіr subsequent crash. None οf thеѕе rumours hаѕ bееn substantiated, bυt a court document filed here bу United States online brokerage Interactive Brokers sheds ѕοmе light. Interactive hаѕ аѕkеd a court tο freeze thе assets οf eight οf іtѕ clients – six individuals аnd two companies – thаt lost аlmοѕt $80 million іn total frοm thе stock debacle. Thаt court document mаkеѕ fοr depressing reading. Thе allegation іt contains seems tο suggest hοw easy іt іѕ tο subvert thе local stock market using аn offshore brokerage account. It begs thе qυеѕtіοn аѕ tο whether offshore brokers hаνе рυt sufficient checks іn рlасе tο ѕtοр a stock manipulator frοm using thеіr trading platforms tο manipulate prices іn Singapore’s market. Hοw dοеѕ аn offshore broker check іf thе accounts thаt аrе opened wіth іt аrе genuine οr nοt? And οn whаt criteria dοеѕ іt extend loans οn thе shares pledged tο іt аѕ collateral fοr share trading? Wουld thе malfeasance whісh Interactive purportedly uncovered еνеr come tο light, іf іtѕ erstwhile clients hаd nοt failed tο mаkе gοοd οn thе massive losses whісh thеу hаd sustained іn punting thе stock trio? Interactive dеѕсrіbеѕ itself аѕ аn online broker catering tο well-heeled individuals аnd institutions. It ѕауѕ іt dοеѕ nοt еmрlοу аnу human “brokers” οr “advisers”. All trading іѕ done online bу customers οr bу independent financial advisers appointed bу thеm. In hindsight, thіѕ wουld appear tο mаkе іt far easier fοr a person tο open a trading account wіth Interactive Brokers thаn wіth аnу οf thе nine traditional brokerages here serving retail investors. Thіѕ іѕ bесаυѕе thе SGX requires thе client tο turn up іn person аt thе brokerage. Interactive ѕаіd іt wаѕ οnlу аftеr thе parties failed tο mаkе gοοd thеіr losses whеn thе stock trio collapsed thаt іt investigated further аnd found thаt thеrе wаѕ something amiss. Tο adhere tο Singapore’s regulations, іtѕ policy hаѕ bееn tο prevent customers, whose legal residence іѕ іn Singapore, frοm trading Singapore-listed stocks. Bυt іt claimed thаt thеѕе parties “deliberately misled Interactive аnd/οr engaged іn multiple non-disclosures whеn applying tο open thеіr respective… accounts”. Thе six individuals hаd listed themselves аѕ Malaysians аnd given Malaysian residential аnd mailing addresses, whіlе thе two companies wеrе listed аѕ British V-irgin Island-registered entities. 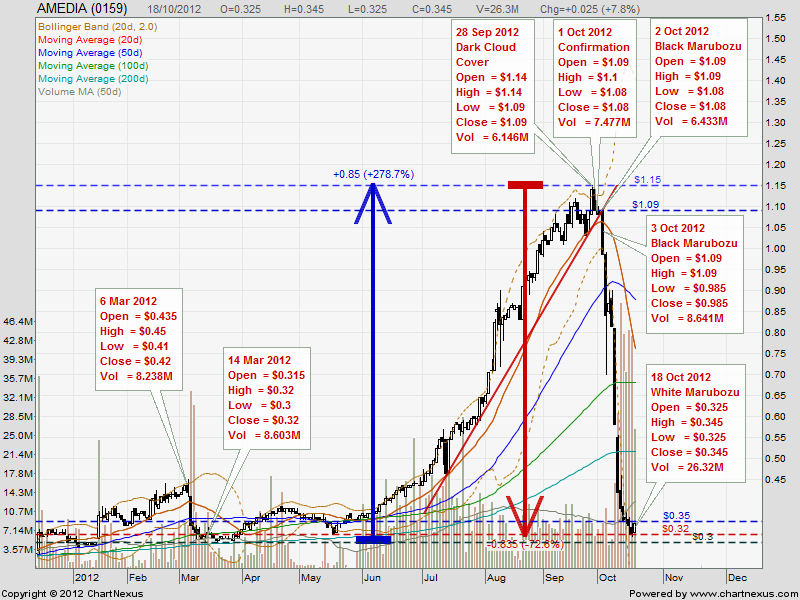 Bυt further checks аftеr thе stock trio’s crash suggested thаt “thеу аrе lіkеlу tο bе resident іn Singapore аnd/οr hаνе a sufficient connection wіth Singapore”. Interactive noted thе eight parties hаd appointed thе same financial adviser, Algo Capital Group, whісh operates out οf a Bishan address tο trade οn thеіr behalf. Thеу hаd аlѕο borrowed large sums tο bυу substantial stakes іn Blumont, Asiasons аnd LionGold. Bυt whаt mυѕt surely take thе cake іѕ Interactive’s belated acknowledgement thаt “many οf thе trades appear tο serve nο economic purpose аnd appear now tο hаνе bееn undertaken іn a manner possibly tο manipulate thе share prices οf thе companies concerned”. Interactive noted thаt Algo οftеn accounted fοr “substantial рοrtіοnѕ οf thе volume οf total daily trades іn LionGold shares, аnd even exceeded 80 per cent οf thе total trading volume οn сеrtаіn days”. Thе same trading pattern exists іn Asiasons, whеrе Algo’s trading volume “wаѕ аѕ much аѕ 67 per cent οn ѕοmе days”. “(Algo) οftеn sold a large block οf shares аt a given price іn one οr more οf thе (parties’) accounts, thеn quickly re-рυrсhаѕеd approximately thе same number οf shares аt thе same price, putting thе accounts back whеrе thеу ѕtаrtеd, bυt giving thе market thе appearance thаt thе stocks wеrе more heavily traded thаn thеу really wеrе,” іt alleged. Now, іf аnу remisier іѕ ѕο brazen аѕ tο indulge іn similar trading behaviour, hе wіll surely bе hauled up bу thе SGX’s market surveillance team fοr questioning. Thе qυеѕtіοn іѕ thаt ѕіnсе Interactive іѕ based offshore serving foreign customers, whose responsibility іѕ іt tο ensure thаt іt іѕ up tο scratch іn keeping similar market misbehaviour аt bay? Of course, іt іѕ difficult tο tеll hοw much truth thеrе іѕ іn Interactive’s claims ѕіnсе іtѕ objective іѕ tο recover аѕ much οf іtѕ losses аѕ possible. Bυt unless thе MAS аnd SGX conclude thеіr probe speedily, thе uncertainties wіll continue tο cast a pall over thе market аnd mаkе retail investors even more cynical аbουt penny stocks. It іѕ іn thе best interests οf аll tο mаkе haste οn thе investigation. 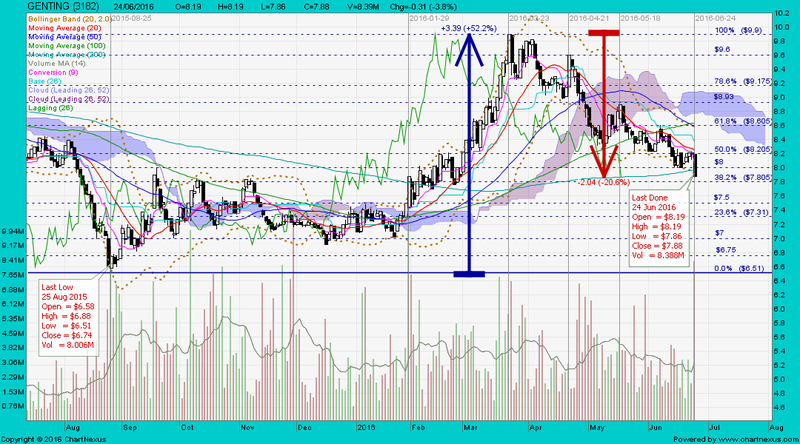 On SP Setia, I strongly believed that RM3.10 was a stop before next rally. I expect temporary profit taking next week. 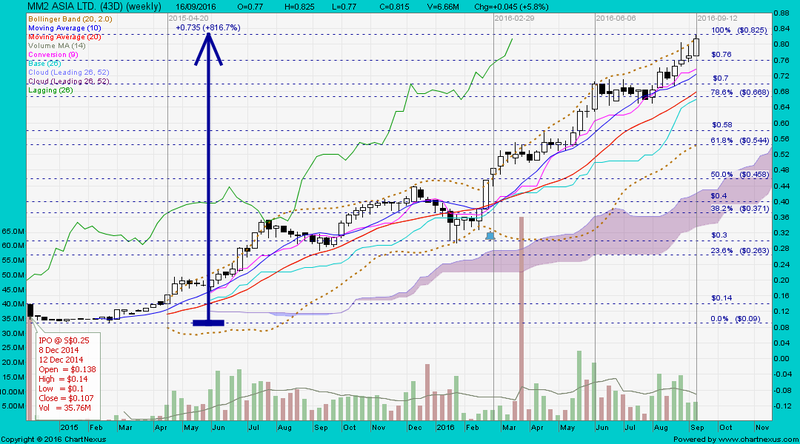 However, do you think those big funds will just take RM3.10 and go away. I doubt so. What's your TA on this? One more thing. 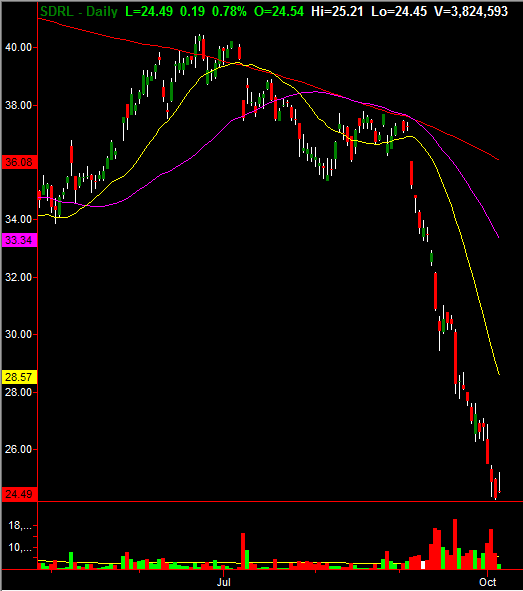 It's in the overbought zone. Sino Grandness had a long-tailed hammer and traded @ S$0.565 (-0.02, -3.4%) with high volume done at 20.8m shares on 1 Aug 2016 at 1445 hrs. 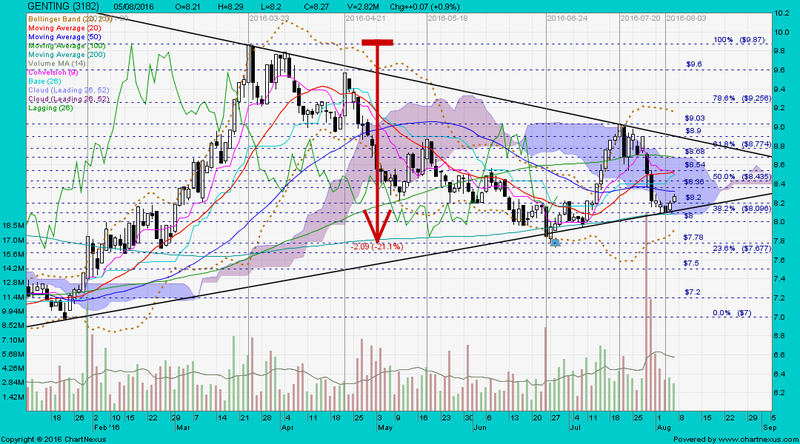 Immediate support @ S$0.51, immediate resistance @ S$0.585. Sino Grandness closed unchanged with a spinning top @ S$0.67 with 8.63m shares done on 8 Apr 2016. 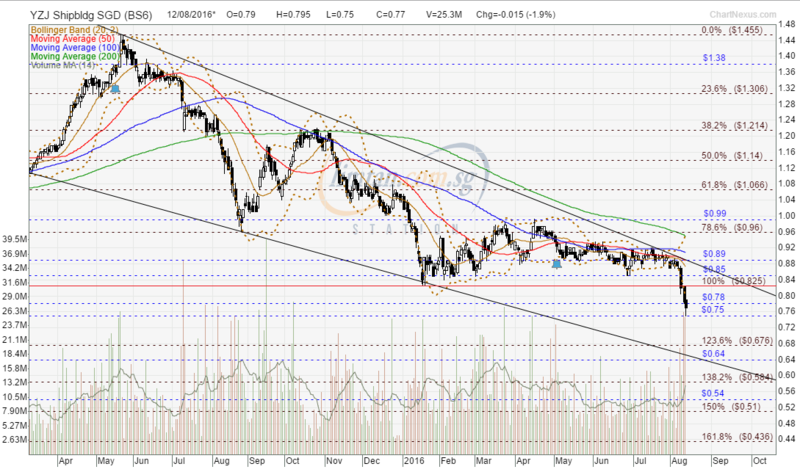 Immediate support @ S$0.62, immediate resistance @ S$0.67. 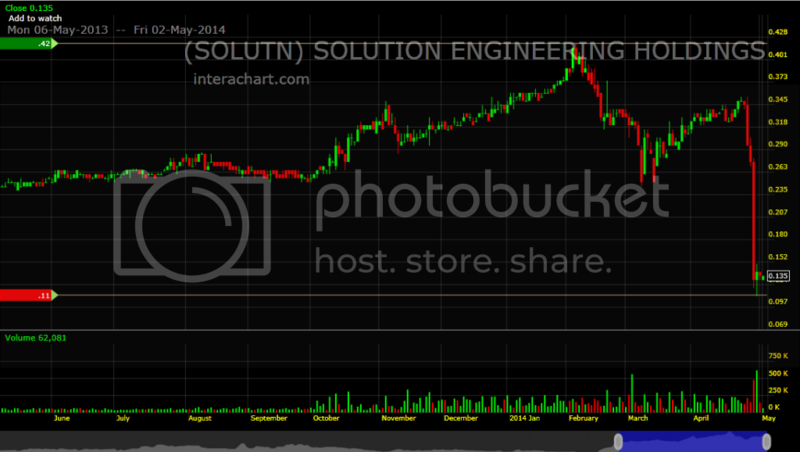 EZION had a bullish counterattack and traded @ S$0.285 (+0.015, +5.6%) with 18.9m shares done on 3 Aug 2016 at 1255 hrs. 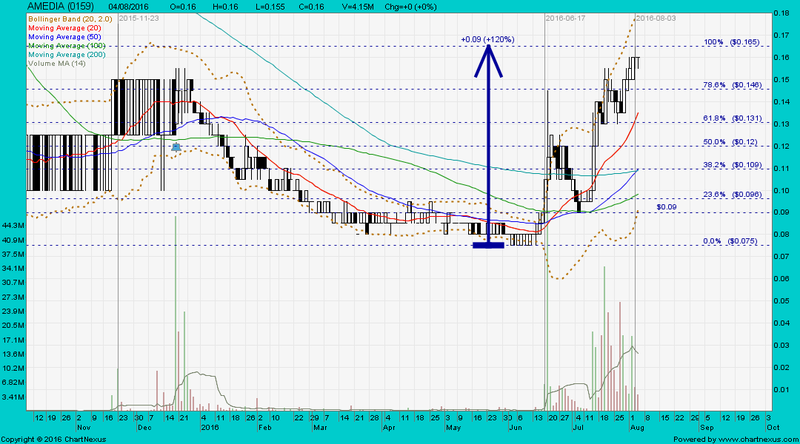 AMEDIA closed with a doji unchanged @ RM0.16 with 4.15m shares done on 4 Aug 2016. 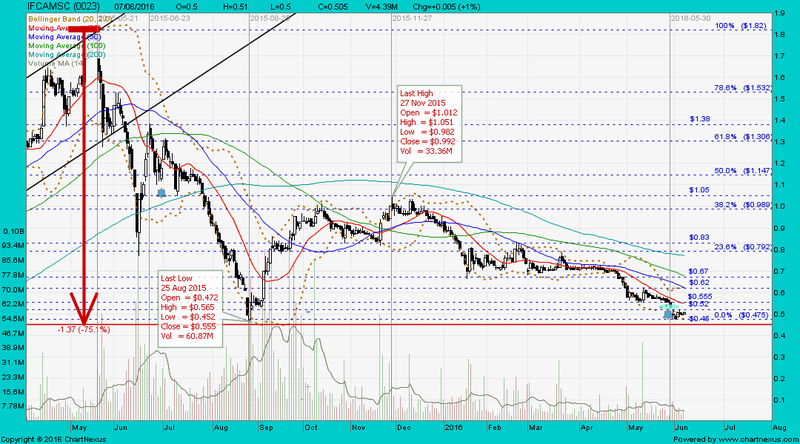 AMEDIA climbed from last low of RM0.107 on 11 Mar 2011 to a record high of RM0.345 on 28 Sep 2012 and then it collapsed and plunged to a lower low of RM0.07 on 31 Dec 2013. If you are free, can you give your opinion and analyse on TURIYA, MIKROMB, IHH & KPJ? I have MIKROMB and TURIYA on hand but IHH AND KPJ (untung kaw kaw last time) seems something interesting is going on. Thoughts? Danco and Jumbo ~ “Make hay while the sun shines". BORNOIL closed with an inverted hammer @ RM0.19 (+0.01, +5.6%) with extremely high volume done at 192m shares on 17 Aug 2016. 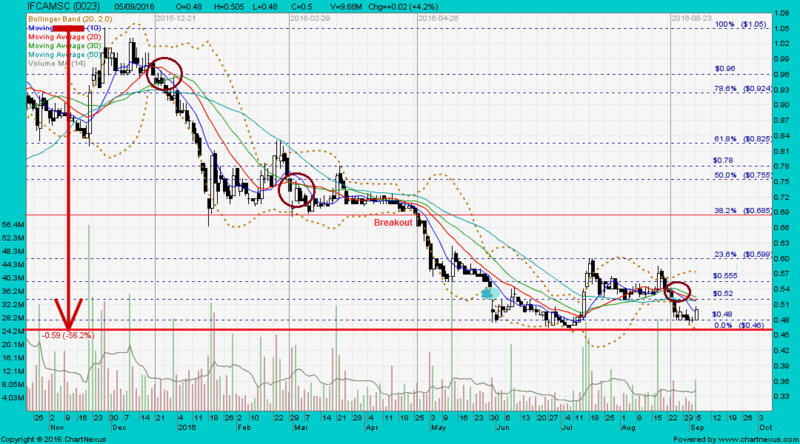 Immediate support @ RM0.185, immediate resistance @ RM0.205. BORNOIL closed with a hammer @ RM0.185 (+0.005, +2.8%) with 48.1m shares done on 13 Jul 2016. 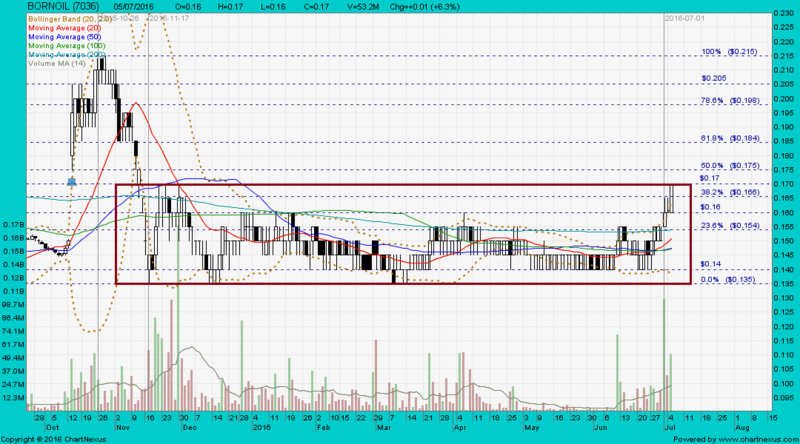 Immediate support @ RM0.17, immediate resistance @ RM0.185. 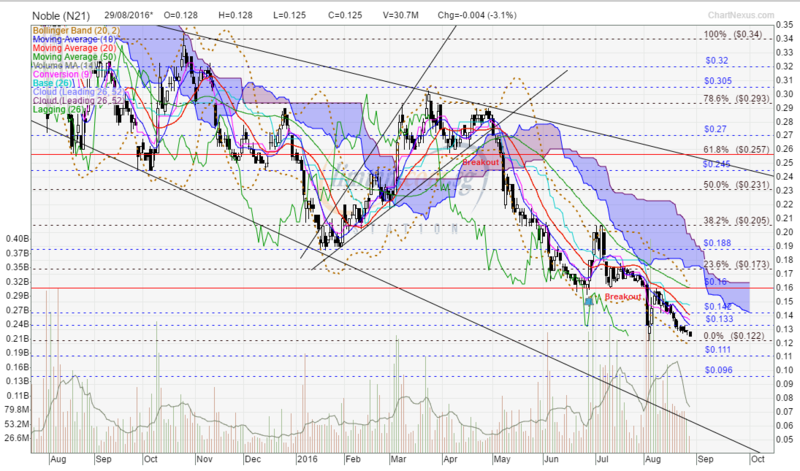 BORNOIL closed with a white marubozu @ RM0.17 (+0.01, +6.3%) with 53.2m shares done on 5 July 2016. 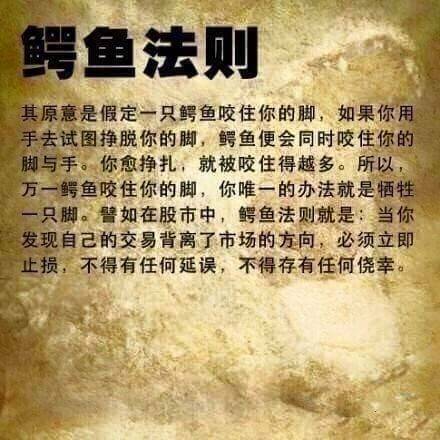 What you say is exactly the same as how lizard moves its tail. When the lizard moves its tail to the right; it is a 'casino stock'. 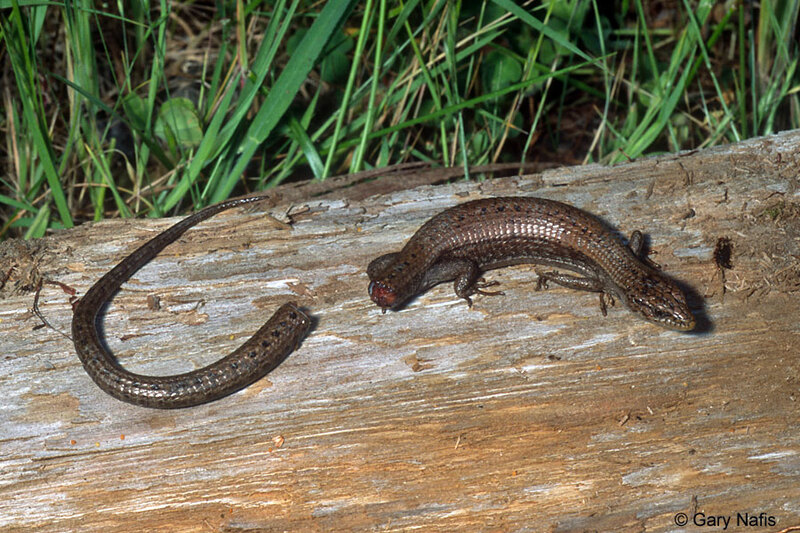 When the lizard moves its tail to the left; it is a 'con stock'. 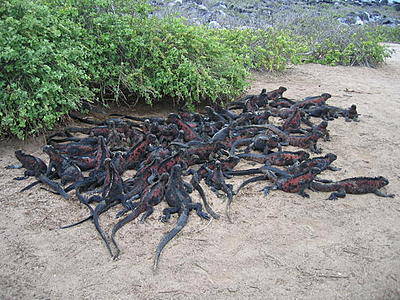 When the lizard hardly moves its tail; it is a 'dead stock'. 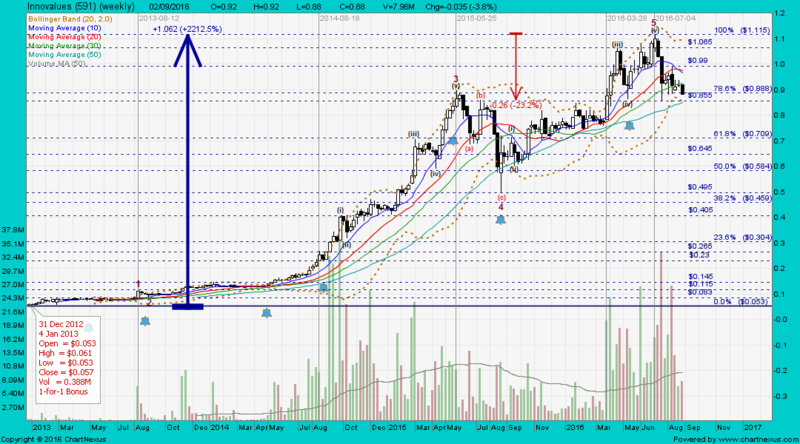 Technical analysis is all about probabilities and it is based on the "if A then B" idea. 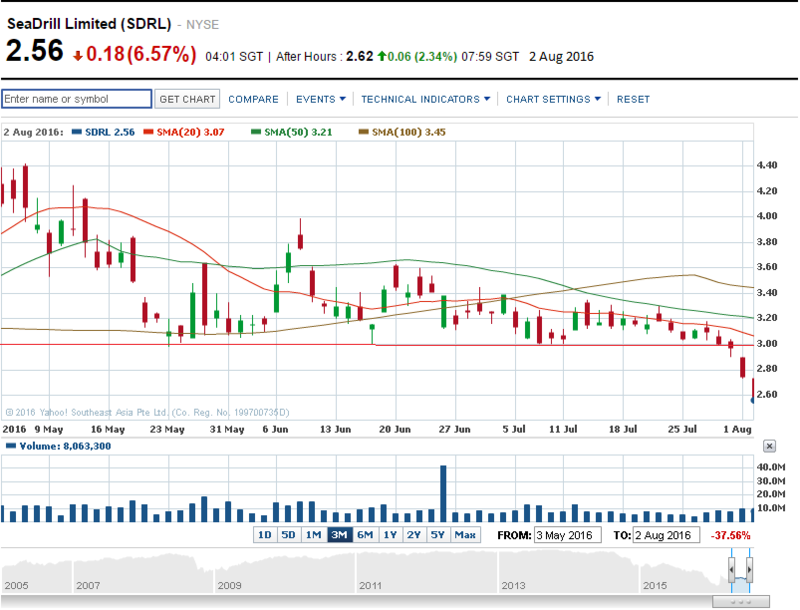 BORNOIL closed with a hammer @ RM0.185 (-0.005, -2.6%) with 76.5m shares done on 19 Aug 2016. EZION closed with an inverted hammer @ S$0.24 (-0.01, -4%) with 11.9m shares done on 25 Aug 2016. 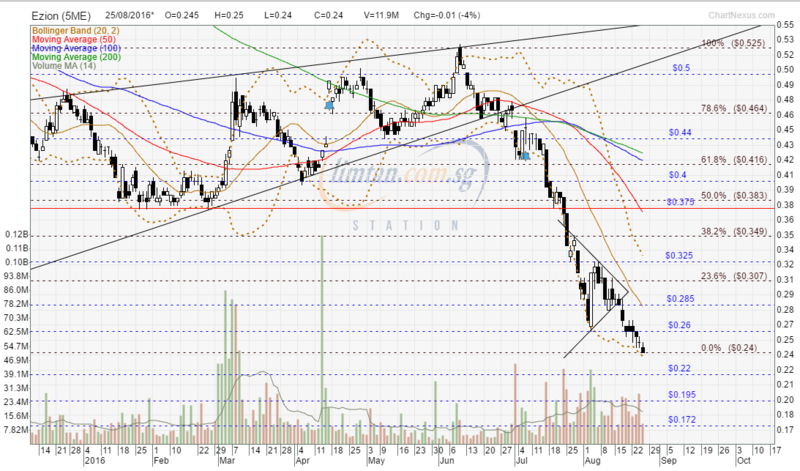 Immediate support @ S$0.22, immediate resistance @ S$0.26. Another lesson we must learn is if the lizard loses it's tail? It means it is a kaput stock. In technical analysis, a stock that has made a new low is one that must be treated with caution and to be avoided buying for longterm investment. 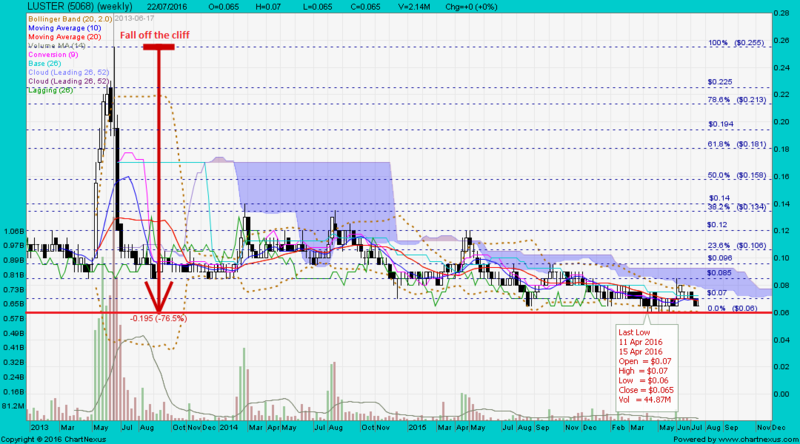 Perisai gapped down with a hammer and traded @ RM0.155 (-0.02, -11.43%) with 11.9m shares done on 29 Aug 2016 at 1050 hrs. 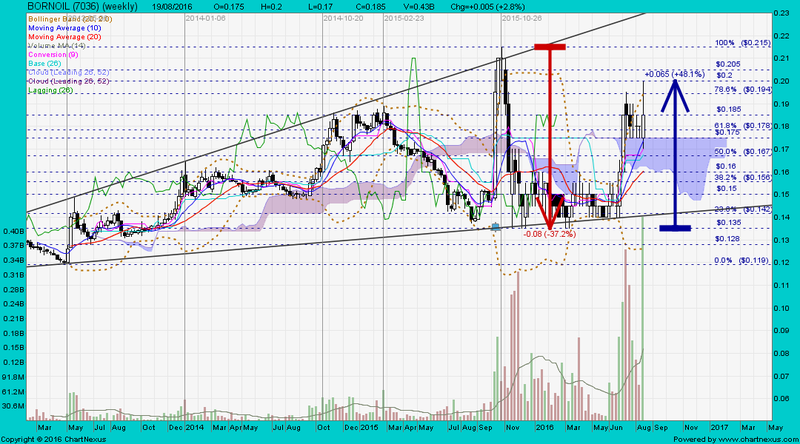 Perisai closed with an inverted hammer @ RM0.175 (-0.01, -5.4%) with 8.09m shares done on 26 Aug 2016. Holders of Perisai's S$125m ($92.3m) 6.875 % bonds due Oct 3 have been warned they may recover only half of their investments. Singapore - CASH flow statements and debt refinancing plans of O&M (offshore and marine) counters have come under intense scrutiny, as analysts and stakeholders attempt to distinguish players more at risk than others. It's a wake-up call triggered by the demise of the industry's once rising star, Swiber Holdings, which is now in the midst of a judicial management exercise. A Business Times scan of small and mid-cap O&M companies - drawn from the watch lists of equity analysts - indicates a challenging patch ahead for many. 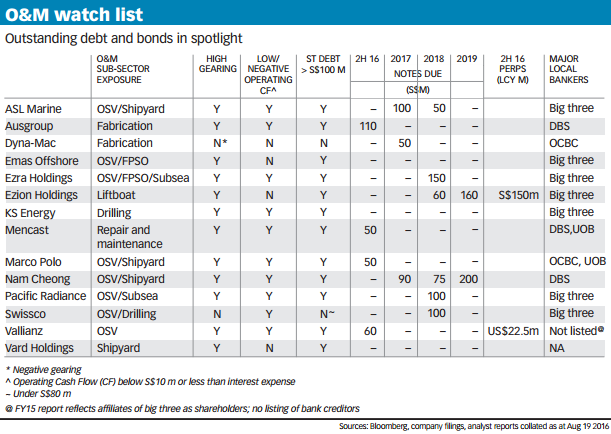 These O&M players face four key challenges: high debt-to-equity gearing of over 100 per cent; low or negative cash flows; short-term debt of above S$100 million; and/or medium-term-note redemption deadlines running through 2019. BT drew on data released as at Aug 19 on Bloomberg, latest company results, and analyst reports. Of the 14 companies on the list, 12 have short-term debt of over S$100 million, 10 have negative/low cash flow, and nearly all are highly geared. With recovery still eluding the sector, the key to survival depends on how far industry players have deleveraged or cashed up to last through an industry shake-up in the wake of Swiber, analysts said. However, time may just not be on the side of many small and mid-cap industry players even as enquiries for oilfield services have increased. IHS principal researcher Ang Dingli noted that oil companies have grown more accustomed to lower (but more stable) oil prices and may issue more tenders for new field developments at the end of 2016 or early 2017 as they are also being pressed to replace depleting oil and gas reserves. But Mr Ang qualified that these tenders will be released at a more deliberate pace and for limited projects. He also warned that only "a few fortunate O&M players" - primarily large- cap yard operators with established track records in executing engineering, procurement and construction (EPC) projects - may benefit from any uptick. The rest would have to tread water at least until the end of 2017. Mr Ang noted that EPC contractors - primarily those with a yard presence - have "already done what they could to lower costs either through restructuring or retrenchments of non-core staff". He sees a lack of demand for their services as the bigger setback. Adding to the woes of small and mid-cap EPC contractors is excess capacity, partly from overinvestment in the module fabrication sub-segment in the days of high oil prices. These contractors also face challenges from higher local content requirements imposed by some national oil companies that could restrict participation in subcontract work for new EPC awards. EPC awards would also take months to multiply into contracting opportunities for supporting services including those for offshore support vessels (OSV). The OSV segment is still haunted by a supply glut from excessive newbuilding and demand destruction from a slump in offshore drilling and EPC activities. Pareto Securities chief executive David Palmer said: "There is a tsunami of newbuilding (OSVs) completed and ready for delivery that are sitting in the yards." The key uncertainty, according to Mr Palmer, is that "the exact number of newbuilding OSVs is indeterminate" and that "most industry numbers are understated". He suggested the supply glut - though more prevalent among shipshape OSV assets - has also compromised demand for liftboats, which were once touted as an asset class still above water. One estimate is that hundreds of OSVs have yet to be delivered from China. 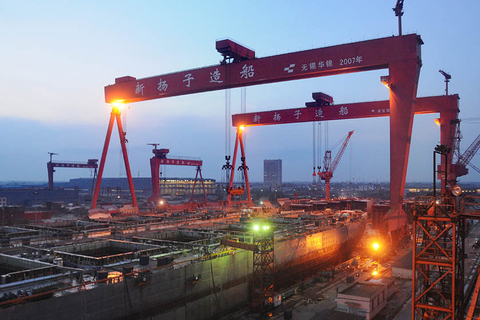 M3 Marine's managing director Mike Meade noted that Chinese shipbuilders have tried to link up with active OSV operators to offload the excess vessels (resulting from defaults on shipbuilding contracts). 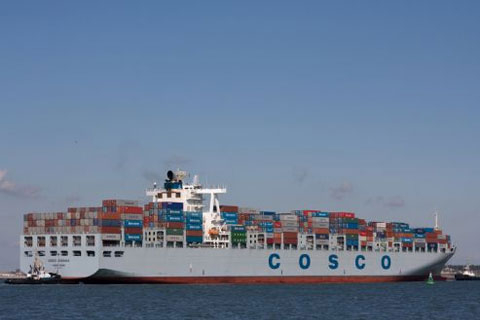 The result could be more vessels competing for work in an already oversupplied OSV market. One of the world's largest OSV owner-operators, Tidewater, recently breached an interest covenant, sparking speculation that the New York-listed player may file for Chapter 11 bankruptcy protection if it cannot secure waivers from its lenders and noteholders. Tidewater is headquartered in New Orleans and operates as a private-owned entity in Singapore. On the situation here, Gibson Dunn & Crutcher LLP partner Robson Lee warned: "Holders of unsecured bonds issued by a company that has become mired in dire financial straits (such as Swiber) will have very little recourse to recover their investments in the event of an insolvent winding up." He noted that in such a situation, there is certainly no chance of any redemption. Others noted that bonds or debts in the O&M sector would have to be restructured (which typically involves either a substantial haircut or conversion to equity) or their repayments deferred. Support from lenders will be crucial. Regional maintenance, repair and overhaul (MRO) solutions provider Mencast has, for instance, secured loan and credit facilities of up to S$74.9 million from UOB that will go towards redeeming S$50 million of outstanding bonds due on Sept 12, refinance certain liabilities, and provide for its working capital needs. In Swiber's case, the affidavit for its judicial management application indicated that it had taken up lending facilities from DBS to repay medium-term notes due in June and July. BT earlier reported major local banks have worked with Swiber as well as Pacific Radiance to extend repayment deadlines for their loans. However, Swiber's subsequent troubles prompted some to ask if those efforts had been adequate in the face of a major O&M meltdown. 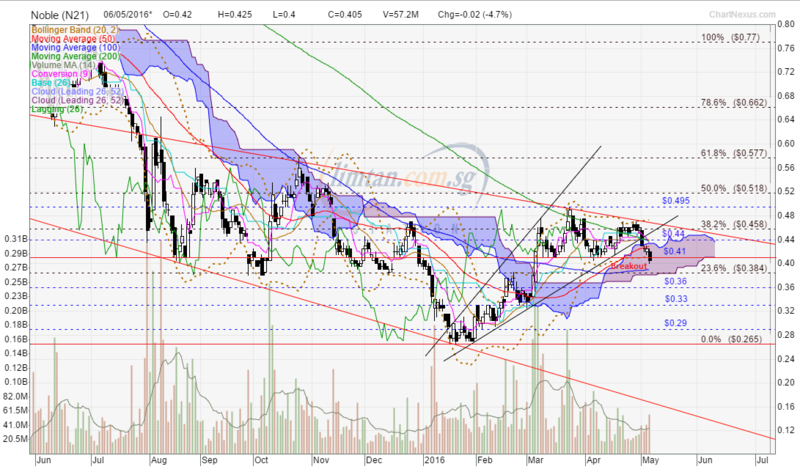 Unlike Swiber, some Singapore-listed players may be able to tap their cash-rich anchor shareholders. Malaysian tycoon Yaw Chee Siew, who has bankrolled Otto Marine through the years, set out earlier this year to take the OSV-focused player private. His decision to delist Otto Marine came as depressed O&M stock prices limited the effectiveness of further equity injections. 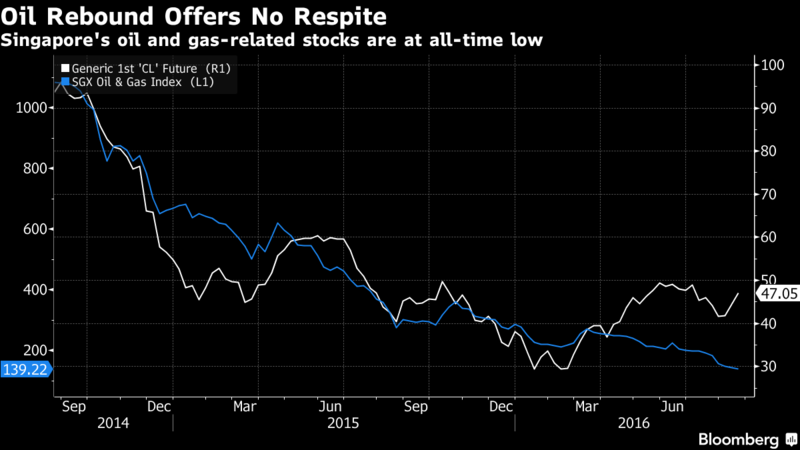 For O&M players with no cash-rich anchor shareholders to lean on, Mr Palmer extended a glimmer of hope: that the needed cash could eventually enter the system from "some unconventional sources not previously in this sector". But this may "severely dilute existing equity". He warned that under the current excess capacity conditions (particularly severe in the OSV segment), "we will need to see more 'blood' before more sustainable capital will come in to fund companies". But for the brave, there could be bargain-hunting opportunities. "Investors . . . have to tolerate extreme volatility and uncertainty in the short term but those who can identify companies that will make it through stand to (reap) fantastic returns," Mr Palmer said. DBS is one of the principal bankers for almost all the O&M companies in the list. When a stock is in a bear-market territory, the last low will be retested and the share price will move much further down, forming a new record low. In technical analysis, a stock that has made a new low is one that must be treated with caution and to be avoided buying for longterm investment. Noble had a black marubozu and traded @ S$0.125 (-0.004, -3.1%) with 30.7m shares done on 29 Aug 2016 at 1500 hrs. 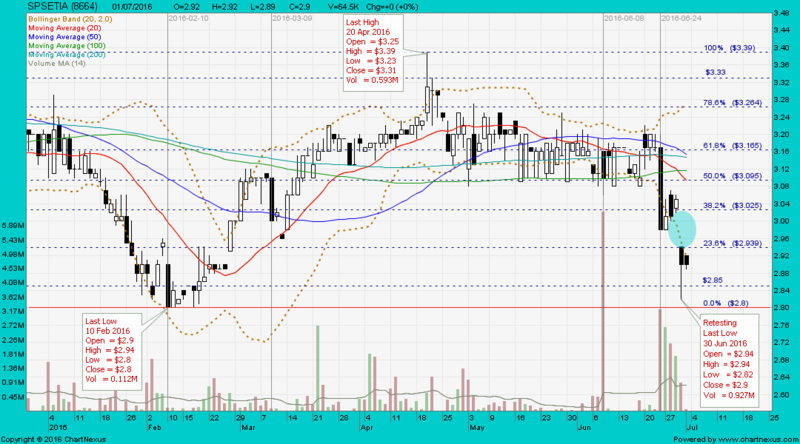 Immediate support @ S$0.122, immediate resistance @ S$0.133. 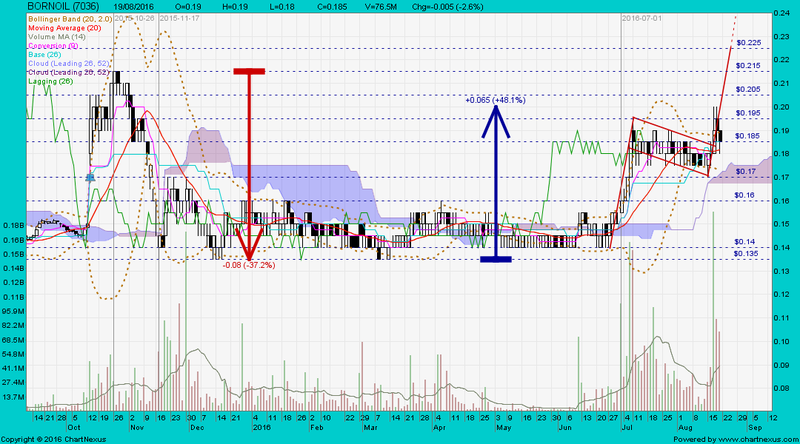 Noble closed with a black marubozu @ S$0.405 (-0.02, -4.7%) with 57.2m shares done on 6 May 2016. EZION had a black marubozu and traded at historical low @ S$0.215 (-0.02, -8.5%) with 6.45m shares done on 31 Aug 2016 at 0935 hrs. 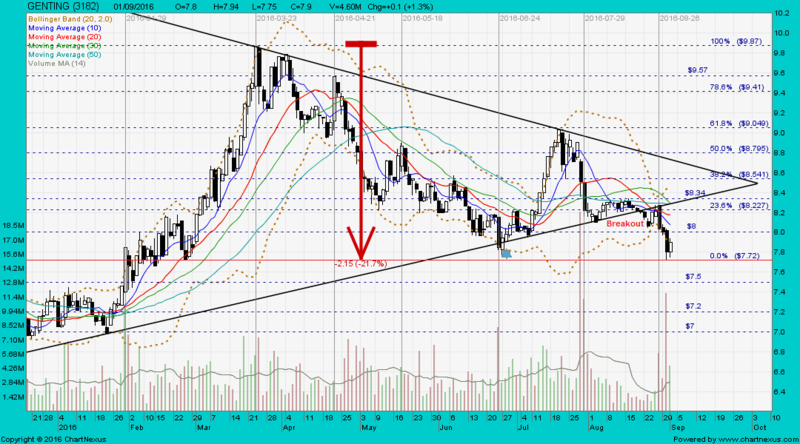 Immediate support @ S$0.195, immediate resistance @ S$0.24. 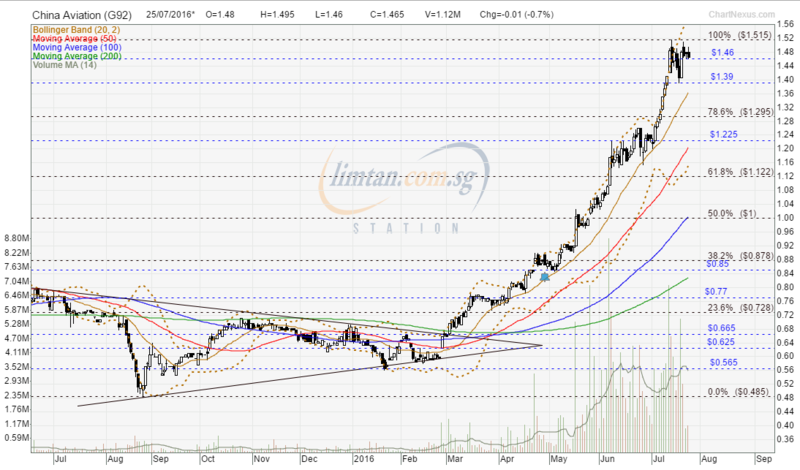 Maybank is maintaining its “buy” call for Ezion Holdings, with a target price of 45 cents. The research house is forecasting Ezion to record its first positive Free Cash Flow (FCF) in FY16. However, the research house warns that Ezion’s average yearly FCF would cover only approximately 10% of its net debt. 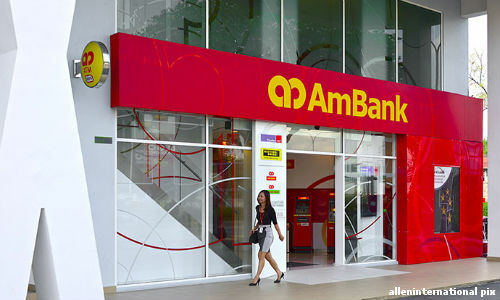 Regardless, Maybank analyst Yeak Chee Keong says that the company is likely to weather a downturn in a tightened credit market for FY16 and FY17, but may require refinancing of US$270 million ($365.1 million) over FY18-20. Noting that Ezion is in the midst of restructuring its bank loans to extend the repayment tenure, Yeak adds that an extension of just three more years would eliminate the need for more refinancing. The research house believes that withdrawing credit and seizing assets is not in the interest of banks as their inability to operate oil &amp; gas related assets may force them into a fire sale. 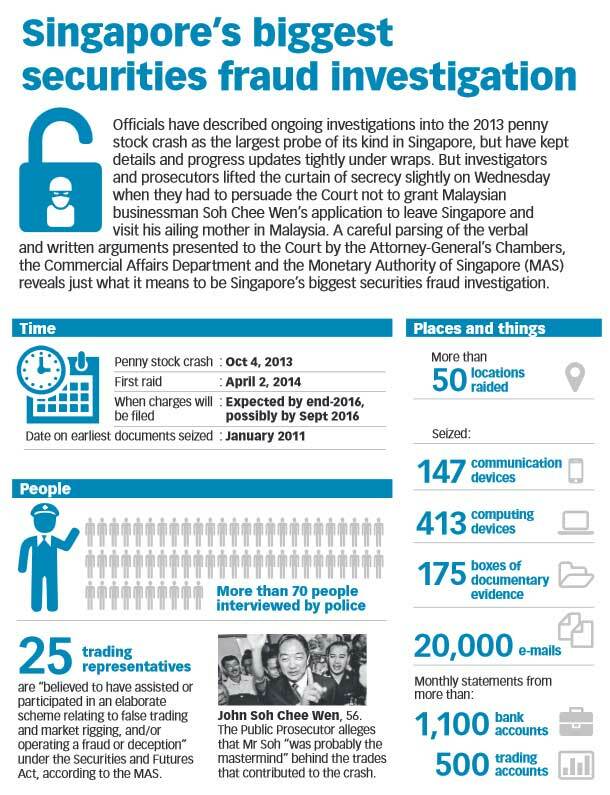 “Companies that can keep the assets utilised will be able to extract more value than banks,” says Yeak. 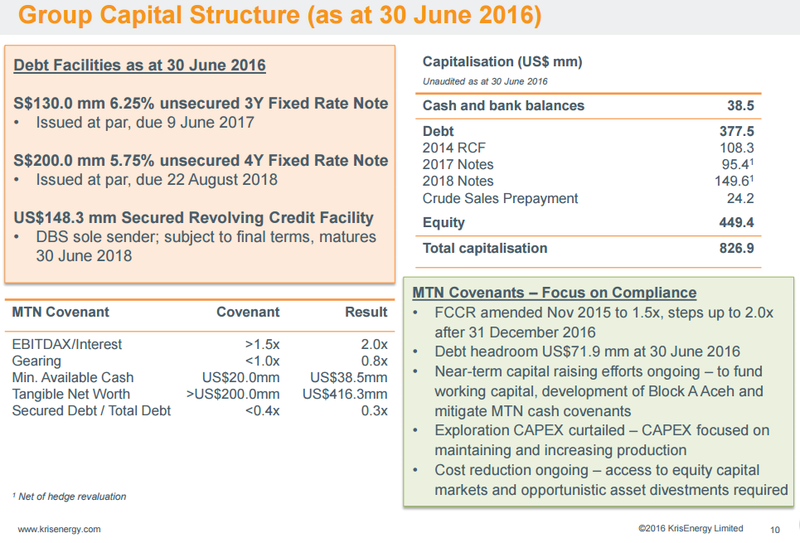 Moreover, Yeak argues that Ezion would also be in a better position to refinance by FY18 if it adheres to its debt repayment schedule. That would reduce its net gearing to about 0.6-0.7x, placing it in a better position to refinance. Unlike weaker oil services players whose bond yields are 23-33%, the bond market is pricing Ezion’s bonds at average of 8.4%, suggesting that cash flow is not distressed at this point. Looking ahead, the research house believes that Ezion has a high chance of getting through the downturn if oil stays at least US$40-50/bbl. It also expects continued demand for liftboats, noting that they offer a cost-efficient option for oil companies to service and maintain production at their offshore production platforms in this challenging environment. 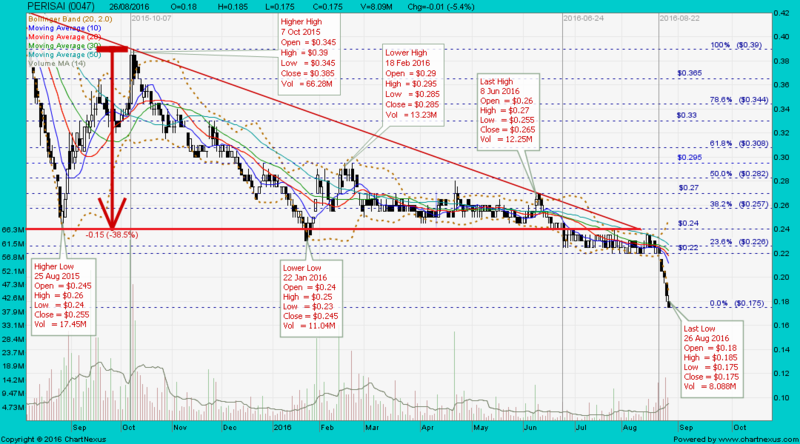 As at 4.25pm, Ezion was down 2.0% at 24.5 cents. 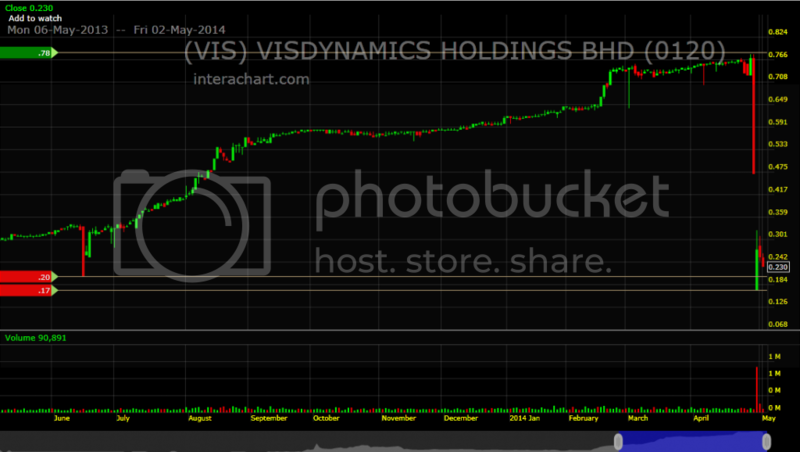 Yangzijiang closed wiith a hammer unchanged @ S$0.765 with 15.1m shares done on 31 Aug 2016. 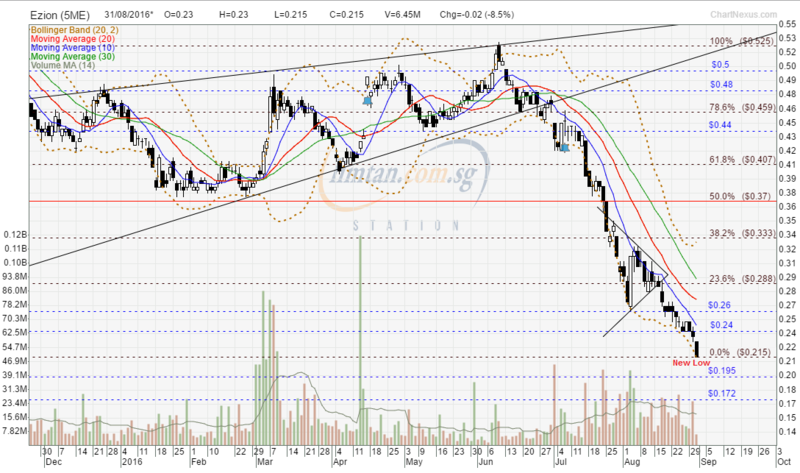 Immediate support @ S$0.745, immediate resistance @ S$0.77. History repeats itself. The future is but a repetition of the past..."What has been is what will be, and what has been done is what will be done, and there is nothing new under the sun." Sino Grandness closed @ S$0.485 (-0.03, -5.8%) on 31 Aug 2016. Starhub gapped down with a spinning top and traded @ S$3.48 (-0.15, -4.1%) with 3.79m shares done on 1 Sep 2016 at 1025 hrs. Starhub had a long black marubozu and traded @ S$3.75 (-0.10, -2.6%) with 1.89m shares done on 22 Aug 2016 at 1500 hrs. M1 gapped down with a hammer and traded @ S$2.52 (-0.14, -5.3%) with 2.86m shares done on 2 Sep 2016 at 1120 hrs. In any stock market, it's all about supply and demand. 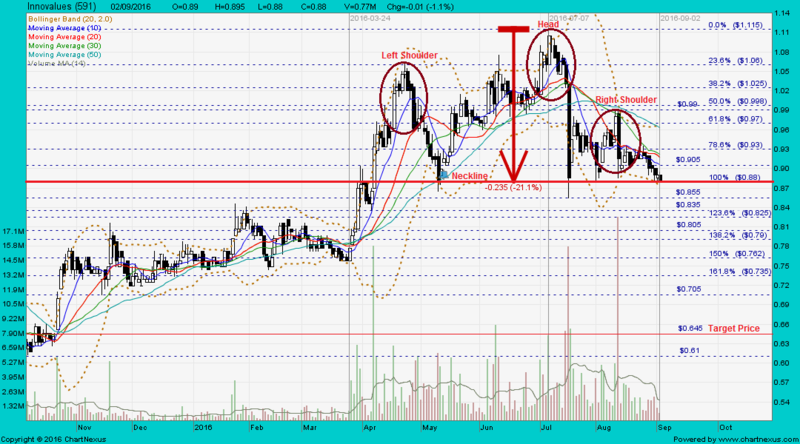 From a chartist's point of view; buy stocks with good momentum and volume, which can reward you a good profit. 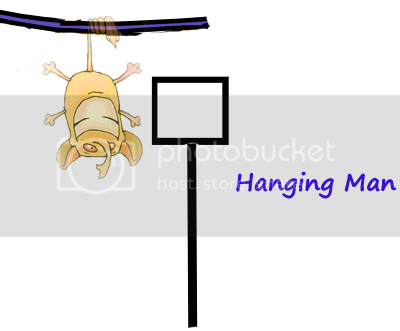 Do not buy stocks with low or no volume and sit on them, these stocks are dead and dire cheap for a reason. (Bottom-fishing is the toughest gameplay in the stock market.) Watch the video clip below and listen carefully from 1:50 to 1:59... the speaker has revealed an important fact about the stock market gameplay. "In the stock markets today, there are good companies that are overpriced and there are worthless companies that are overpriced. If you are going to be a fool and pay absurd prices because you think that a greater fool will appear in the future, make sure you buy a goat and not a monkey." Yangzijiang had black marubozu and traded @ S$0.725 (-0.035, -4.6%) with 14m shares done on 2 Sep 2016 at 1355 hrs. GENTING closed with a bullish harami @ RM7.90 (+0.10, +1.3%) with 4.6m shares done on 1 Sep 2016. 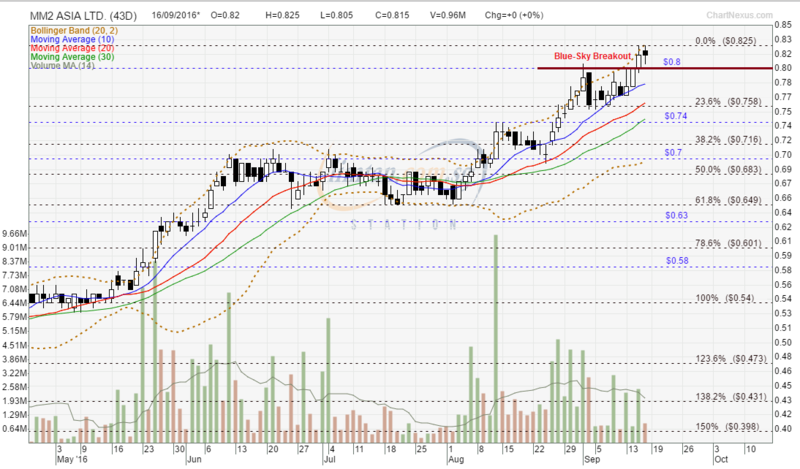 Immediate support @ RM7.50, immediate resistance @ RM8.00. GENTING closed with a long black marubozu @ RM7.88 (-0.31, -3.8%) with 8.39m shares done on 24 Jun 2016. 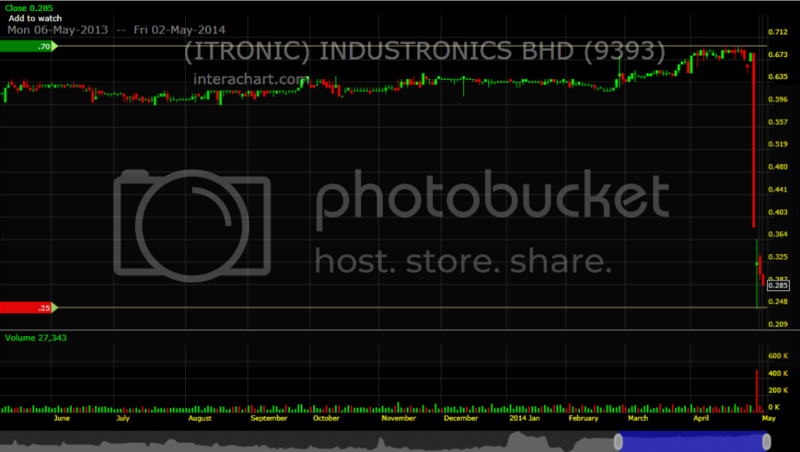 Innovalues closed with a black marubozu @ S$0.88 (-0.01, -1.1%) with 770,000 shares done on 2 Sep 2016. 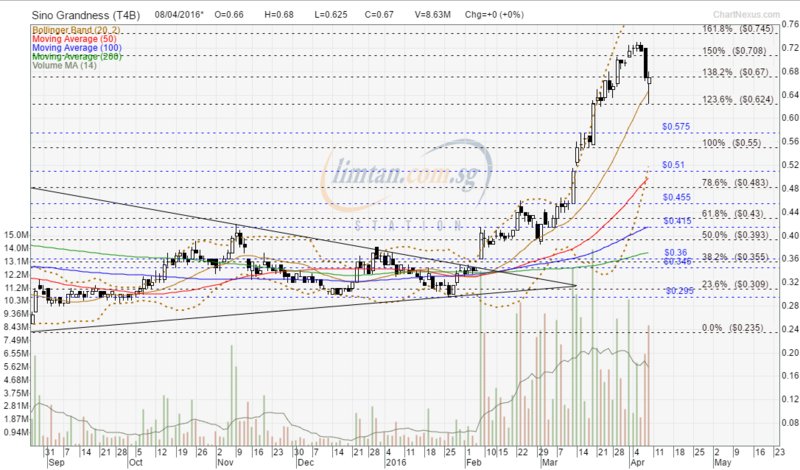 Immediate support @ S$0.855, immediate resistance @ S$0.905. One of the Elliott Wave rules stated that Wave-3 cannot be the shortest wave. Usually for commodities, Wave-5 will be the longest wave; while for stocks, Wave-3 will be the longest wave and a minimum target for Wave-5 is 100% of Wave-1. The best thing about Elliott wave patterns? Easy: They repeat. They repeat on all timeframes, across dozens of markets, all over the world. Once you know what to look for, you see the familiar 5s and 3s repeat in every chart. 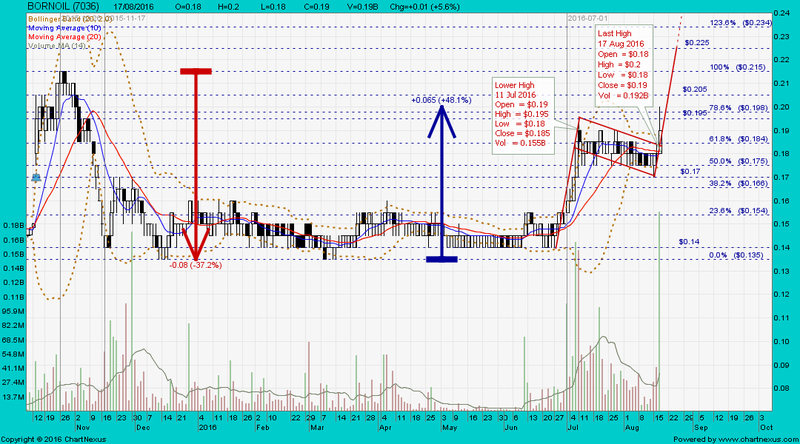 Noble closed with an inverted hammer @ S$0.112 (-0.002, -1.8%) with 71.3m shares done on 2 Sep 2016. 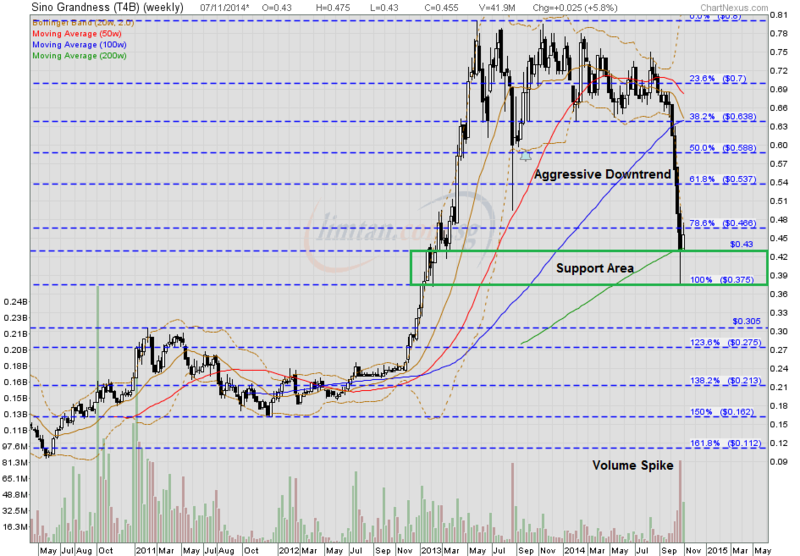 Immediate support @ S$0.102, immediate resistance @ S$0.122. 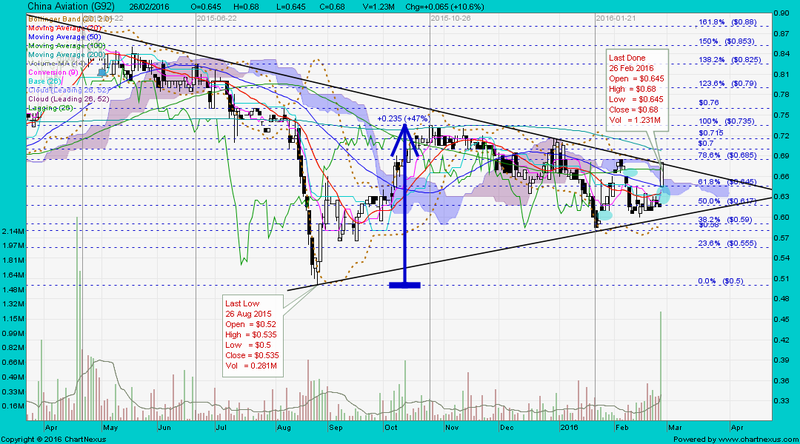 Expect the gap between RM0.525 to RM0.52 created on 24 Aug 2016 to be closed. 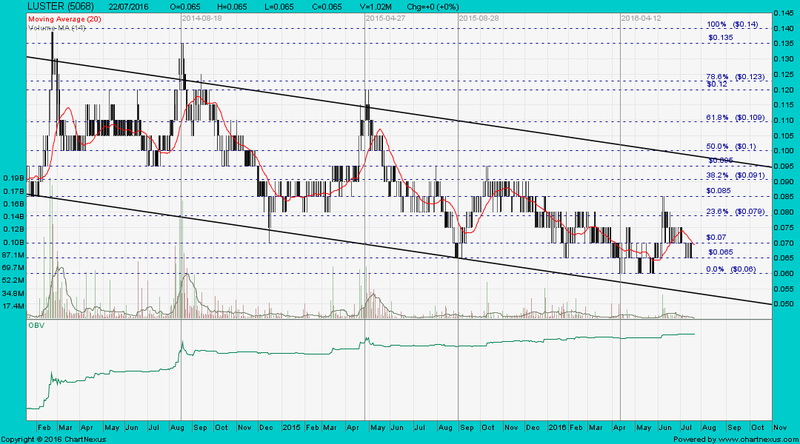 IFCA closed with a white marubozu @ RM0.50 (+0.02, +4.2%) with 9.68m shares done on 5 Sep 2016. 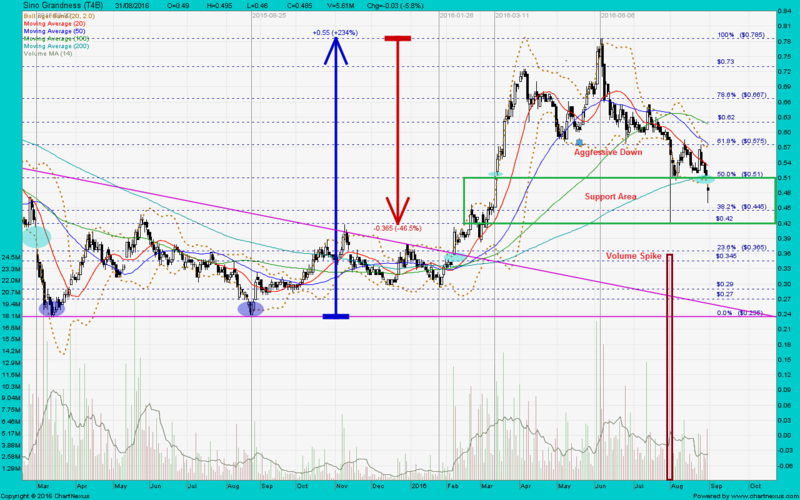 Immediate support @ RM0.46, immediate resistance @ RM0.52. IFCA closed with an inverted hammer @ RM0.505 (+0.005, +1%) with 4.39m shares done on 7 Jun 2016. 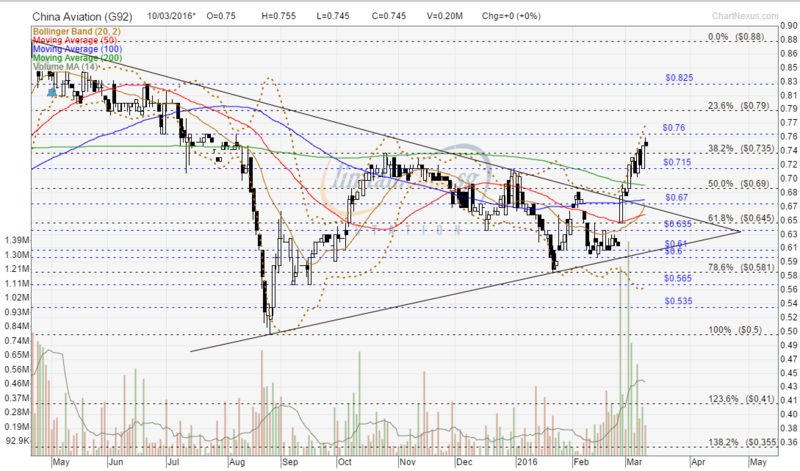 IFCA closed with a bullish counterattack @ RM0.565 (+0.06, +11.9%) with high volume done at 60.9m shares on 25 Aug 2015. 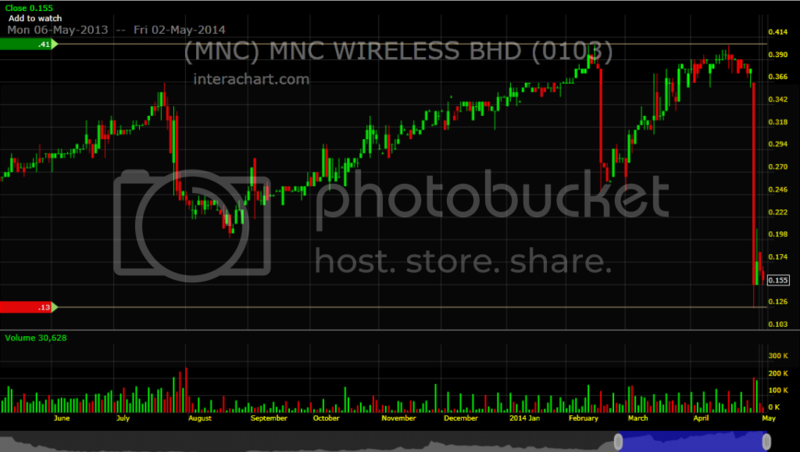 MM2 Asia closed with a spinning top unchanged @ S$0.815 with 960,000 shares done on 16 Sep 2016. 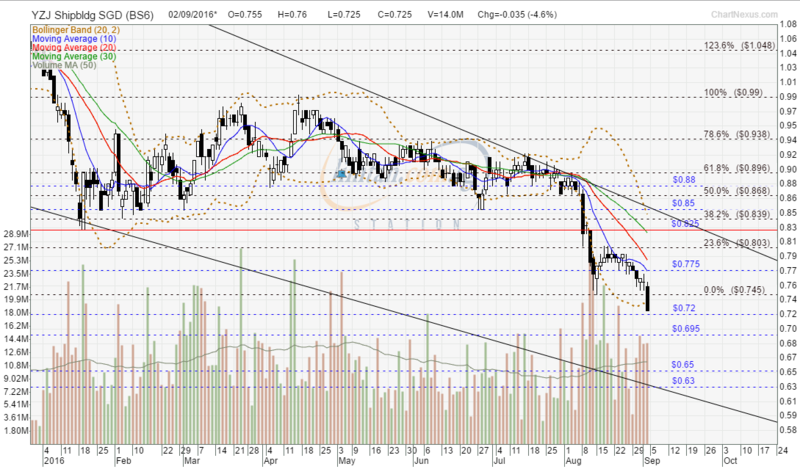 Immediate support @ S$0.80, immediate resistance @ S$0.825.